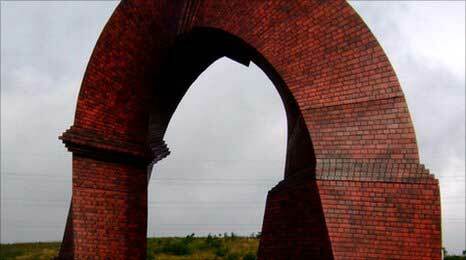 A twisted chimney created by a New York sculptor has been unveiled as a public artwork in a south Wales valley. 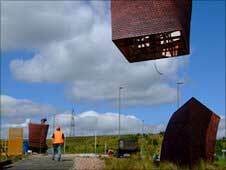 Simnai Dirdro (Twisted Chimney) by Brian Tolle is located near the village of Butetown, just off the A465 near Rhymney, Caerphilly county. Tolle's first permanent UK artwork represents a former ironworks chimney that once stood in the Rhymney Valley. Hand carved out of steel, the £180,000 sculpture is 16 metres in length and twists eight metres into the air. Tolle is renowned for using history as the basis for his artwork. Simnai Dirdro stands on the site of the Union Ironworks - built around 1800 - but is intended to create a futuristic vision in contrast to more literal depictions of mining history. Emma Maria Price from public art agency Safle was instrumental in attracting the artist to Wales. His previous work includes the Irish Hunger Memorial, which took up an acre of land by the Hudson river in his home city New York. It remembers victims of Ireland's potato famine in the 19th Century. "Everyone said you'll never get Brian Tolle over to a small village in south Wales and on your budget", she said. "But we sent him a comprehensive brief and got him interested in the history. "I'm over the moon. It puts Wales up there in artistic terms. This is not about creating a monument. It's an artwork, a piece of beauty." A short film by Welsh artist Stefhan Caddick will also be shown at the unveiling of the sculpture on Thursday. The Bogey Road weaves archive footage dating back to 1918 with contemporary material shot on locations in and around Butetown. The chimney and the film were were commissioned by Caerphilly County Borough Council and Safle. They were funded though a Welsh Assembly Government project to regenerate the Heads of the Valleys. Simnai Dirdro is to be unveiled at 1400 BST on Thursday, followed by hourly screenings of The Bogey Road from 1500 to 1800 BST at St Aidan's Church in Butetown, Rhymney.